for the love of learning: Are Provincial Achievement Tests in Alberta High Stakes Exams? Assessment is not a spreadsheet -- it's a conversation. Are Provincial Achievement Tests in Alberta High Stakes Exams? I had a very cool conversation the other day with Alberta's Minister of Education, Dave Hancock. I have a lot of respect for Dave. I think he's an Education Minister that gets "it". His tireless work on Inspiring Action is showing the province and the world that Alberta takes progressive education seriously. For more on how on this, the Inspiring Action: A Discussion Paper is an excellent read. I am well aware of suggestions that Alberta's testing programs are "high stakes tests" that place undue stress on students. In the case of Grade 3, 6 and 9 Provincial Achievement Tests, these assertions are simply untrue. Those tests do not drive curriculum (as with the diploma exams, assessments are constructed after the curriculum has been prepared), and they have no impact on students' progress or teachers' pay or promotion. 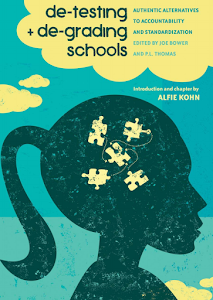 They exist solely to provide to teachers, parents, principals, superintendents and Alberta Education information that can be used to formulate improvement strategies. Firstly, I challenged Minister Hancock to speak directly to grade 3, 6 and 9 teachers, students and parents and ask them if they felt like Provincial Achievement Tests (PATs) are high stakes. I assured him that an overwhelming majority of people would say that PATs are indeed high stakes and high pressure exams. The high stakes for teachers is evident from the Alberta Teachers' Association member survey data which shows that approximately one-third of teachers have either been discouraged from teaching grade 3, 6 or 9 or have opted out. And for the students, many schools through out Alberta count the PAT as a part of the students final grade - which serves to further heighten the PATs stakes. Secondly, I explained to Minister Hancock that schools' guidance councilors and Alberta's mental health professionals experience more demand from students for their support and services during Provincial Achievement Test season. Unfortunately, my conversation with the Minister had to come to an end, but he assured me that he wanted to hear more about this. (I am not an Alberta teacher, I teach in Ohio) There is probably no overt "pressure", but if you say the tests are important, or you say we want you to do well on the tests, you raise the stakes and make the test important. They may not be "high stakes" as in you will not graduate if you do not pass, but just by having the test, taking time out from learning, and talking about them, you give them "high stakes" If we did not care about the outcome, why have the students take them. I guess it depends on your definition of "high" stakes. If these were "just another test" the province wouldn't be putting out Parent Guides and asking Parent Councils to review the results with the school staff. Here in Washington State (USA), our Washington Assessment of Student Learning (WASL) was implemented the same way. It was meant to be a "one day snapshot" or "a dipstick" just to let us gauge how we were doing as a state. That purely informative intention lasted about 6 months. Once politicians and parents had the scores in hand, comparisons were made and blame was being assigned; and then things got ugly. This predated George W. Bush's No-Child-Left-Behind laws by about 2 years. BJ, that reminds me of the old saying: the road to hell is paved with good intentions. A father we know from our son's bus stop won't be going anywhere for spring break next week. Instead, he's staying at home to prepare his 8 year old daughter for the Grade 3 PAT. His explanation was that "we don't want her to bring the class average down." Where would he have gotten an idea like that? The worst part, in my mind, is that she is a dancer (think: Sir Ken Robinson). She is likely to spend another nine years being subtly told she's a failure because her talents aren't recognized in school. Does your question exclude Alberta grade 12 Diplomas? Coincidentally, as well as shamelessly self promotingly, my most recent blog post was on this subject. But yes, I feel that these tests are absolutely high stakes. Every school I've taught at spends a good amount of time on regression analysis. As an English teacher, I have no idea what any of those numbers and bar graphs mean, but the message is clear: spend time looking at last year's results and make plans to improve this year's. Individual students and their needs are not brought up in meetings like that. While issues like this need oxygen, we have to be aware of ways in which the 'testing' discussion defaults to adults--educators, parents, politicians, etc.--while excluding students. Our discomforts are borne upon our students, verbally and non-verbally. To balance the issue, we should also explore and consider ways that everyday classroom assessment can be 'high stakes' for students. ~ How do we ensure transparency and meaningfulness (for students) of the learning targets and success criteria? ~ How are we aware of the range of artificial and authentic assessment possibilities, and sensitive to students' preferences and experiences of them? While I recognize the question in this post funnels toward a yes/no response, I will play the grey card here. Assessment includes the evidence of learning collected through purposeful, mindful, skillful learning design. Tall order indeed! Sound assessment acknowledges the amazing complexities of human relationships, learner needs, curricular outcomes, hopes, misconceptions, fears, and opportunities for growth. It is a challenging responsibility and privilege to assess student work. There are many, many assessment moments in a student's everyday world. Teachers, more than anyone, sculpt and influence that world. For as long as we are teachers, the topic of assessment will require our ongoing craftsmanship and collective inquiry. It's worth puzzling over together. I took time to post a comment last night. I verified the post, but today it has disappeared. In the response, I said I was playing the 'grey card.' I'm curious whether the reply was removed for suggesting that we need to broaden the discussion to look closely at ways that our classroom assessment is high stakes? Diverse points of view, respectfully submitted, make us stronger at our craft and better for our students. As professionals, we need to work hard to ensure our discussion environments don't become echo chambers. A little part of me hopes that some inexplicable technological error took away my reply. I worked hard on it and wanted to be part of the discussion. This, too, is respectfully submitted in the spirit of collegiality. Thanks for restoring. Much appreciated. Maureen, are PATs high stakes? So my principal comments that they will not be ready for PAT's. They will fail. Oh, and recently, students cannot think logically. A majority of my students are not at their grade level, so undoubtedly, they will not all achieve acceptable standards. That's a given. I'm just happy if they increase from a grade 3 writing level to a grade 4. It's ridiculous to put undue pressure on teachers who are teaching in an inclusive class, without an aide, might I add, to make students achieve excellent results on PAT's. PAT's need to consider other factors, such as IPP's in assessing achievement. Alberta Education needs to stop suggesting we sugarcoat grades to avoid hurt feelings, and we need to stop pushing kids through to the next grade based on attendance-not merit. 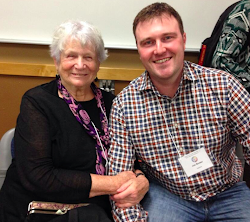 I am Joe Bower (and that is Deborah Meier) and I teach in Red Deer, Alberta, Canada. I wish to challenge 'traditional' schooling while exploring more progressive forms of education. I intend on using this blog to uproot some of the most deeply rooted myths that continue to distract people from a love for learning. And I am going to have fun doing it!